I love Fallout 4. This will amaze the people who know me as the guy who mercilessly dumped on the beloved Fallout 3, and bore everyone else, because by this point the internet is awash in Fallout 4 love. But what's interesting here is that I was completely irritated with Fallout 4 at the start. The first big encounter had me rolling my eyes, sighing heavily, and - by the end - gritting my teeth. And from that messy opening, the game managed to win me over. The setup is this: You roll into town for the first time after exiting the tutorial. You find a small group of people beset by raiders. The leader of this group is Preston Garvey, a warm and trusting guy who immediately befriends you. He lets you have a set of power armor and a minigun to fight off the raiders. As you're killing the raiders, a deathclaw shows up and you have an "epic" fight with it. 1. The deathclaw gets no build-up. Deathclaws are one of the signature bad guys of the franchise and one of the most memorable parts of the first game. This has nothing to do with the monster design and everything to do with how the monster was introduced. In the first game, you begin hearing rumors of deathclaws long before you encounter them. They're blamed for various attacks and you hear spooky stories about how fearsome and powerful they are. People are terrified of the name, and you can't tell which rumors - if any - are actually true. Your quest drags you into a cave to confront one, and even though it was a turn-based game with simple 2D sprites, that confrontation was a thousand times more thrilling than the surprise deathclaw in Fallout 4. By this point in Fallout 4, the player has never seen or heard of one. Nobody is worried about them. There's no tension and no stakes. Your character is fighting for people they just met against a monster they've never heard of in a town they just arrived in using overpowered weapons they didn't earn. You might argue that this is the fourth (or eighth, depending on how you count) game in the series, and so a prolonged build-up isn't needed. But I'll point out that even in other long-running franchises (the Aliens movies are a good example) giving the monsters a proper introduction is just Storytelling 101. It's possible to feel new suspense for an old threat, as long as the author is letting us see it through the eyes of new characters or in new situations. This sequence has all the mechanical elements of a major show-down, but without any of the required groundwork to give it emotional heft. 2. The Power Armor feels totally unearned. In the first game, the Brotherhood of Steel - at the time the only people with access to power armor - were almost an Easter egg. It was possible to go through the entire game without meeting them. If you did meet them and wanted a set of their glorious power armor for yourself, you had to join their ranks. This was no easy task and would take you to some strange places that you'd never visit otherwise. Even then, it took some doing to get them to cough up a set of power armor for you. The game sold this notion that power armor was precious, exotic, and powerful. When you finally slipped on your power armor you felt like you were getting away with something. You'd stolen the fire of the gods. Sure, the power was exhilarating, but so was the sense that this was a secret, forbidden power and that you had cheated the system to get it. For contrast, in Fallout 4 you're basically handed the power armor by total strangers the moment you exit the tutorial. It feels about as special as a participation trophy. 3. Preston Garvey is WAY too nice. This is actually one of the lingering problems with the game. The Preston character is a boring mess. Preston doesn't even feel like he's part of this world. Fallout has quite a bit of Mad Max in its DNA. It's supposed to be this world gone mad, a desperate landscape of survivors who cling to life by letting go of their sanity. Nearly everyone you met in Fallout 1 was at least a little crazy in some way. 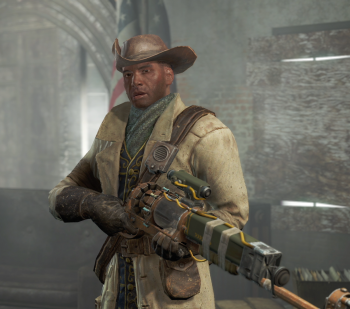 But here in Fallout 4, Preston comes off like the Mister Rogers of the apocalypse. He's just generically nice to you because he can tell you're the player character. He's dressed like a footsoldier in 1776 and he's carrying a "laser musket". Nearly everyone he's ever known has died in the last month. He's the leader of a movement that's quickly going extinct. His character design is practically screaming out "This character should be wild and eccentric!" Making Preston some sort of Trevor Phillips-style lunatic would fix everything. It would explain his unrealistic ambitions, his deference to the player, and his dedication to a seemingly lost cause. It would even explain why he gives you the power armor. "I'll be honest, Vault-dweller. I really thought that old suit was gonna blow up the moment you hit the power button. In fact, it kinda gives me the willies just standing this close to you." So if the intro is so bad, how did Fallout 4 recover? The intro feels like it was tacked on for the purposes of making trailers and press demos. (In fact, I strongly suspect this is the case.) Preston Garvey is indeed generic and boring, but he's also simple enough that you can immediately understand him in just a couple of seconds, which is exactly what you want in an abbreviated demo where there's no time for nuance. Later on, there are numerous characters who have much smaller parts but far more interesting character designs. 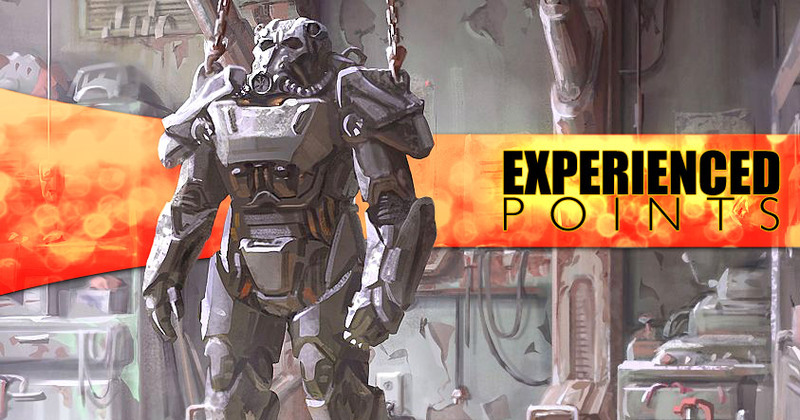 The power armor feels unearned, but later you'll learn about the upkeep costs of using it and discover it's something of a guilty pleasure and probably not something you can use all the time. The game basically said "the first hit is free" when it comes to power armor. Yes, that first rampage might have been fun, but you're going to have to scrounge for fusion cores if you want to do it again. The deathclaw is robbed of its status as a boogeyman of the wasteland, but there are other foes that get lots of buildup. Some are even connected to the main story in interesting ways. The important thing about the Fallout 4 intro is that it's completely unlike the rest of the game. It sets up expectations that this game is going to be a shallow story of boring characters and cheap gratification, but then the designer turns around and starts building up a colorful, interesting, multi-sided conflict where you're allowed to form your own opinions, choose sides, and have all kinds of crazy adventures that are well worthy of the Fallout name. I've had lots of good games turn suddenly bad on me, but I've never had a game turn suddenly good like this. The game won me over with fun ideas, a few solid characters, and a great big wasteland full of interesting stories. Shamus Young is a programmer, critic, comic, and survivor of the dot-com bubble.